Come along as we journey back through time and get acquainted with our nation's presidents, from General George Washington to our current Commander-in-Chief, Barack Obama. Find out about the events that propelled these men into the highest office of the United States of America and what remarkable and memorable deeds marked each of their presidencies. 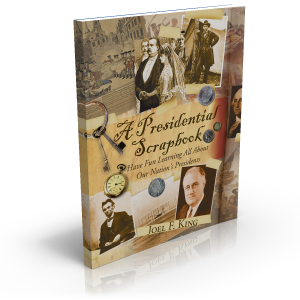 This scrapbook of America's presidents documents humble beginnings, historic triumphs, stirring speeches, heroic attempts, utter disasters, patriotic loyalty and strange coincidences - did you know that two former presidents died on America's 50th birthday? Walk through 225 years of United States history through the eyes of our presidents. And when you are finished, and think that you have learned all that you can, try your hand at the President Quizzes to find out how much you really know! Thank you very much for the amazing Presidential Scrapbook! Even my history loving hubby has gotten a kick out of the "new" facts he's read about! We will get a lot of use out of this book in the future, and it will be lovingly displayed on our bookshelves. How beautiful it is! Prefer the ebook? Save $4 on the book itself plus another $4 approx. because there are no shipping costs. An Even-Better Deal! $35 Combo Price for both books! 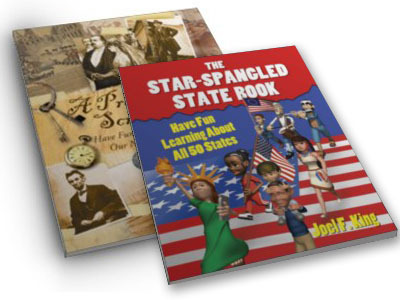 Purchase Joel F. King's The Star-Spangled State Book (retail $25.95) and get them BOTH for just $35! You save $8 (32%) when you purchase both books. You can read more about the Star-Spangled State Book here.